CableKeeps give your dull white iPhone charger some personality and added utility. They secure your USB docking cable to Apple power adaptors used with iPhones, & iPods so cable & charger stay together. 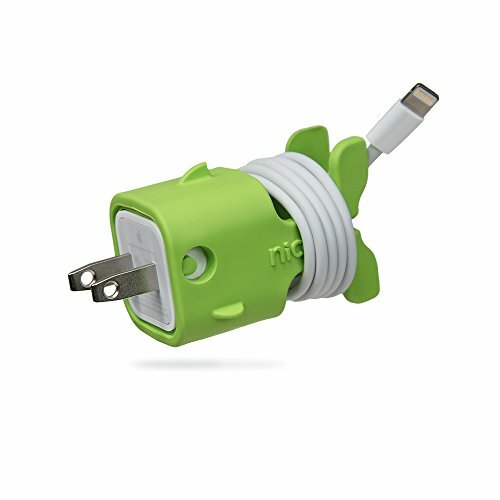 The intuitive design will keep your cables tangle free when shoved in a bag, pocket, or purse and can shorten and organize when plugged into the wall. Goldie features a second function as a charging pedestal for iPhones & iPods, keep your device off the floor or counter when charging. Secures cable and charger together, never lose! If you have any questions about this product by Nice, contact us by completing and submitting the form below. If you are looking for a specif part number, please include it with your message.